Where do your learn coin tricks. Well, there are a lot of books you can start with on coin magic. 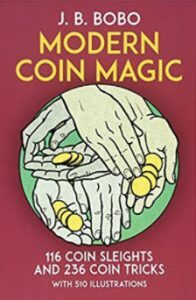 But for decades, the answer to the question has been “Bobo!” That is short for Modern Coin Magic: 116 Coin Sleights and 236 Coin Tricks, by J. B. Bobo. As dated as the book is, it does cover all the basics and then some. 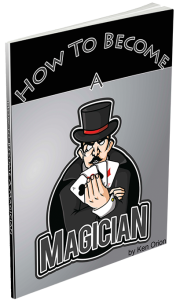 You’ll get a strong foundation in coin magic with this book. Basically, there is very little in the coin magic world today that cannot trace its roots to something in Bobo. Yes, there are dozens, probably hundreds of books and DVDs on coin magic. And we’ll talk about a lot of those. But really, you should – for the ten bucks it will cost you – get yourself a copy of Bobo’s. To get started doing just that, find out more about it at Amazon HERE.